Robinson was a complex man with many sides to his nature. In addition to being a prolific writer and editor, he was a connoiseur of art, an expert on forestry and an aficionado of historic houses. He numbered among his friends nearly all the leading botanists and horticulturists of the day as well as contemporary artists whom he invited to illustrate his publications. Even though he was a lifelong bachelor, his professional and personal acquaintances included such notable women as Ellen Willmott, Viscountess Wolseley and the American landscape architect Beatrix Farrand, in addition to Gertrude Jekyll. His most questionable attribute, however, was his reputation for being overly opinionated, a trait he shared with many other visionaries. His contempt for ineptitude as well as his disdain for those who held opinions contrary to his was legendary. Among his circle of friends, however, he was revered for his humour, charm and vitality. Opinionated or not, Robinson built his reputation on his ability to market his exceptional knowledge of horticulture through his various publications--he was the author of nineteen books and editor of eight periodicals. Born in Co. Down, Ireland, of humble origins, Robinson quickly rose from a lowly under-gardener on an Irish estate to become one of the most respected voices in the horticultural world. (1) His youthful exposure to the cultivation of hothouse-grown exotic annuals for making fanciful but ephemeral floral patterns in large estate gardens drove him to look elsewhere for horticultural inspiration. He worked at a succession of jobs related to horticulture, including a six-year stint at the Royal Botanic Society's garden in Regent's Park that opened his eyes to the beauties of native plants. (2) His careful and deliberate study of hardy plants and gardening traditions took him to France, Switzerland, and America as well as the British Isles and brought him into contact with important figures in the horticultural world. His American contacts included the famed Harvard botanist Dr Asa Gray, the landscape architect Frederick Law Olmsted and Charles Sprague Sargent, founder of the Arnold Arboretum in Boston. (3) In later years Robinson called upon many experts to contribute to the periodicals he edited. By the time he was in his thirties Robinson was a full-time gardening journalist and was beginning to write books about the horticultural trends he had observed. His first two books dealt with the lessons to be learned from French gardens and in one of these, The Parks, Promenades and Gardens of Paris (1869), his lifelong phobia for pleaching trees and other unnatural uses of plants first surfaced. In 1870 he produced a seminal volume that would influence generations of garden-makers throughout the world. In The Wild Garden, Robinson championed the use of native plants in informal settings. His book opened many readers' eyes to the natural beauty of indigenous plants. Jekyll, for instance, consulted The Wild Garden when she developed her garden at Munstead Wood in the 1880s and 1890s and many Americans acknowledged their indebtedness to the book in their landscape planning. Robinson's interest in the wild garden has sometimes been misinterpreted as an advocacy of wilderness, rather than of landscapes enhanced by the use of carefree hardy, native plants. As he explained in the preface to his book, 'I was led to think of the vast numbers of beautiful hardy plants from other countries which might be naturalised, with a very slight amount of trouble, in many situations in our plantations, fields, and woods--a world of delightful plant beauty that we might in these ways make happy around us'. He cautioned that the term 'Wild Garden' had nothing to do with the idea of 'Wilderness,' nor 'the sowing of annuals in a muddle'. (4) One of its manifestations was naturalistic sweeps of winter aconite, bluebells, daffodils or anemones multiplying by the thousands in woodlands (Fig. 1). (5) Gravetye's grounds remain an outstanding example of a 'Robinsonian garden'. With the founding of The Garden magazine in 1871 and Gardening Illustrated in 1879, journals he edited for years, Robinson hit upon an editorial goldmine. He drew upon his vast resources of professional colleagues and artists to contribute to these widely read magazines. A string of useful books, particularly The English Flower Garden (1883), compiled mostly from articles published in his journals, further buoyed his repute in gardening circles. (6) In short, he was the equal of no other personality in his day, except perhaps Jekyll, whose more lyrical books held sway on both sides of the Atlantic. Coupled with the success of his editorial ventures, Robinson's financial acumen, rumoured to have been based on substantial investments in London property, positioned him to become a man of property. Over the next five decades Robinson would invest a considerable fortune in Gravetye, not only in modifications to the manor house, but also in extensive gardening activities. He published a detailed record of his yearly progress in Gravetye Manor, or Twenty Years' Work Round an Old Manor House, in 1911. (8) In its heyday, Gravetye was surrounded by 1,000 acres of bucolic fields, coppices, and woods (Fig. 2). The rolling terrain of the estate resembled the naturalistic beauties of an eighteenth-century picturesque landscape, replete with a herd of pedigree Sussex cattle whose deep red colour provided a perfect foil for the green countryside. Robinson was definitely full of contradictions. In the early 1890s, he increasingly railed against what he termed 'architects gardens', gardens designed by those he claimed knew nothing about horticulture. As the era's most vocal horticulturist, Robinson decried one of the favourite tricks of architects, the clipping and aligning of trees, as 'barbarous, needless, and inartistic." (11) The pages of his journals flowed with endless criticisms of books about garden design written, he declared, by those 'without any knowledge of plants, trees, or landscape beauty." (12) Robinson especially loathed Blomfield's The Formal Garden in England (1892) for its insensitivity to horticultural concerns and singled out John D. Sedding's Garden-Craft Old and New (1890) as one devoted to 'vegetable sculpture'. (13) In spite of these simmering controversies, Robinson valued the expertise of architects in assisting him with remodelling Gravetye. Gravetye's gardens and landscape entailed a tremendous amount of work, including massive earth-moving and the building of walls, terraces, and pergolas. 'There is so much phrasemongering in matters of garden design and art', he scolded, 'that it is better to deal with actual work.' (14) In addition to the garden and pleasure grounds adjacent to the house, Gravetye had acres of naturalistically planted fields, meadows, and woods. The pleasure grounds were initially conceived along gardenesque lines, but after several years Robinson changed the naturally sloping grade near the house to the flat stone terraces that exemplified Blomfield's stance on garden design (Fig. 3). Unlike Blomfield, however, Robinson dealt with the greater landscape beyond the immediate house. For most visitors, the most breathtaking part of Gravetye was the west garden, brimming with tea and China roses and surrounded by wisteria-clad pergolas, arches, and trellises (Fig. 7). In its heyday this garden was given over to nearly thirty beds of roses and their companion plants, such as dianthus, violas, pansies, forget-me-nots and carnations whose colours were chosen to complement the grey stone of the manor house and the well-worn York pavers of the walkways. With Ernest George's stone summerhouse (Fig. 8) in one corner and a central sundial placed at the crossing of the two main paths, it had just the right amount of 'formality' to balance the riot of flowers. On higher ground, near the north face of the manor house, Robinson developed an azalea bank and, higher still, a garden devoted exclusively to heathers, separated by a traditional bowling green (Fig. 9). Above that he built an unusual oval-shaped walled kitchen garden that continues to provide the hotel with fresh produce. The east garden, off the entry court, was devoted to magnolias and other ornamental trees and shrubs, including a rare specimen, Davidia involucrata (Dove Tree), first introduced from China in 1904. Gravetye's water garden boasted one of the largest collections of waterlilies in Europe, including a special tank devoted to rare specimens acquired from the French breeder Latour-Marliac. In the belief that Gravetye's gardens were 'full of pictures', Robinson invited several landscape painters to paint them. 'I have worked long and hard to prove that the garden, instead of being a horror to the artist, may be the very heart of his work,' he commented. (21) The English watercolour artist Beatrice Parsons, who captured the dazzling quality of the west flower gardens in several paintings (Fig. 10) was just one of many artists who flocked to Gravetye. Among Robinson's favourite artists, however, were Alfred Parsons RA (Fig. 3) and Henry G. Moon, who captured some of the more subtle aspects of Gravetye. Both were recognised artists who were among the many who contributed illustrations to Robinson's books and periodicals. It was in Henry Moon that Robinson found his most sympathetic artist. Between 1880 and 1905, Moon's sketches dominated the pages of The Garden and The English Flower Garden. Renowned for his lifelike paintings of orchids, Moon appealed to Robinson because of his ability to sketch flowers in a graceful, naturalistic style. The subtle colourings of his drawings and simple arrangement of flowers were very unlike the more stylised renderings that appeared in competitors' publications. (24) In addition to his work as a botanical illustrator, Moon spent weekends in the country painting for his own pleasure. According to Robinson, Moon, like a poet, has 'his landscape days and his flower days'; he later lamented that the artist might have been able to devote himself entirely to landscape painting if he had not spent so much time drawing plants. Moon's brooding landscapes, somewhat reminiscent of Corot, capture the beauty of trees and the luminous colour of the countryside. On outings with fellow artists to the Norfolk Broads, his love of the landscape and trees, especially silvery willows and poplars, came alive. In 1891 Robinson invited Moon to paint Gravetye from the landscape painter's point of view for the course of a year. He and a fellow artist, William Norton, 'worked at pictures' all through the winter, and later exhibited their work in London. (25) Their paintings, numbering nearly seventy in all, followed the seasons of the wild garden from apple-blossom time through the winter. Moon's paintings captured the sweeps of narcissi and crocuses under trees, pastoral sheep pastures, woodland lanes (Fig. 2) and autumnal harvesting scenes. Four years later, Moon and three other artists, including Alfred Parsons, returned to Gravetye to paint Robinson's new waterlily pond. After Robinson's death in 1935, Gravetye was left to the Forestry Commission. 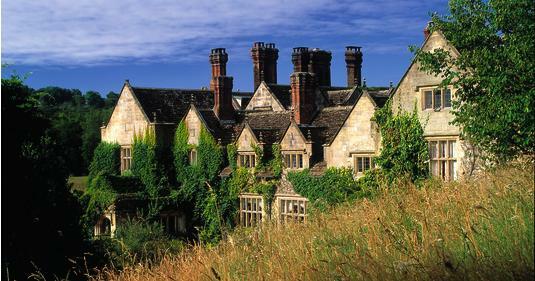 After lying derelict for years, the manor house and thirty acres were leased in 1958 to restaurateur Peter Herbert, who proceeded to transform Robinson's home into one of the leading country-house hotels in Britain. The initial clearing of the garden took place over two years and all the main garden areas have now been completely refurbished, while the once-dense central flower beds in the west garden have been replaced by a smooth green lawn. Today Gravetye Manor is a monument to Robinson's ideals. As he said when he launched Flora and Sylva, his last journal, in 1903, 'I married Flora to Sylva, a pair not far apart in Nature, only in books'. (1) The standard work on William Robinson is Men Allan's William Robinson, 1838-1935: Father of the English Flower Garden, London, 1982. One drawback to Allan's pioneering study is the absence of notes referencing most of the information contained in the book. In recent years, additional articles and scholarly studies have helped to amend this situation, but certain details of Robinson's life and career continue to remain elusive. (2) Details of Robinson's early years are occluded by myths, such as his quitting an employer in Ireland in a huff and putting out the fires in the greenhouse prior to his abrupt departure (ibid., pp. 19-23). See also Ruth Duthie, 'Some Notes on William Robinson', Garden History: Journal of the Garden History Society, vol. II, no. 3, 1974, pp. 12-21. (3) On this trip to America, he dismissed New York City as 'disagreeable and filthy' and found Broadway a sham of fine Parisian boulevards. He thought Olmsted and Vaux's Central Park, however, was 'magnificent'. Robinson maintained a longstanding friendship with Sargent, who sent many rare specimens to Gravetye. In 1916, Robinson was awarded a prestigious medal by the Massachusetts Horticultural Society (Allan, op. cit., pp. 99-100). (4) William Robinson, The Wild Garden or the Naturalisation and Natural Grouping of Hardy Exotic Plants.... London, 1895, pp. xiii-xvi. (6) The English Flower Garden was one of the era's most important books on horticulture and gardening philosophy. See Judith Tankard, 'A Perennial Favourite: The English Flower Garden', Hortus 17, Spring 1991, pp. 74-84, for the history and significance of this book. Some of Robinson's other books are Alpine Flowers for English Gardens (1870), The Subtropical Garden (1871), God's Acre Beautiful or the Cemeteries of the Future (1880), Garden Design and Architects' Gardens (1892), The Garden Beautiful (1907), The Virgin's Bower (1912), Home Landscapes (1914) and My Wood Fires and Their Story (1914). (7) Viscountess Wolseley, 'Historic Houses of Sussex: Gravetye Manor', Sussex County Magazine, vol. III, 1929, pp. 72-76. (8) Robinson's original Tree and Garden Books (2 vols., unpublished manuscripts, vol. 1, 1885 92; vol. II, 1893-1911), containing plant lists and other information omitted from Gravetye Manor, are held in the Lindley Library, London. (9) Devey's remodelling of Gravetye Manor took place between August 1885 and September 1886. See Jill Allibone, George Devey Architect 1820-1886, Cambridge, pp. 13132, 178. (10) Letter, Edwin Lutyens to Lady Emily Lutyens, 24 August 1903, cited in Clayre Percy and Jane Ridley (eds. ), The Letters of Edwin Lutyens to His Wife Lady Emily, London, 1985, p. 106. (11) William Robinson, Garden Design and Architects' Gardens, London, 1892, pp. ix-xi. (13) Ibid., pp. 66, 73. (14) William Robinson, 'In the Garden', Country Life, 4 October 1913, p. 452. (15) William Robinson, 'The Flower Garden at Gravetye Manor', Country Life, 28 September 1912, p. 409. (17) Henry James, Pictures and Text, New York, 1893, pp. 88-89. (18) Robinson, op. cit. in n. 15 above, pp. 409-10. (20) The second edition of Home Landscapes (London, 1920), bears the following subtitle: 'With Views taken in the Farms, Woods, and Pleasure Grounds of Gravetye Manor. Second Edition, with pictures of old English Houses showing the value of natural form in relation to good building; to compare with the disfigurement of the Dutch and Continental Gardens'. (21) William Robinson, Gravetye Manor, or Twenty Years' Work Round an Old Manor House, London, 1911, p. 96. (22) A reprint by Sagapress (1993) of the 1895 edition of The Wild Garden, with Parsons' illustrations, includes a foreword by Peter Herbert, introduction by the author and botanical revisions by Graham Stuart Thomas. (23) Henry James, 'Our Artists in Europe', Harper's New Monthly Magazine, vol. LXXIX, June 1889, p. 58. (24) See 'MoonScape', Country Life, 9 May 1996, pp. 72-73, for a profile of the artist's work by the author. (25) 'A Story of the Year Round a Country House', exhibition at Stephen Goeden Gallery, 57 Pall Mall, London, 1892 (Robinson, op. cit. in n. 15 above, pp. 68 71). (26) Consult 'Pictures in the House, 1895', in Robinson, op. cit, in n. 8 above, vol. ii, pp. 100-106, for a complete list of his collection. Robinson sold off some of his pictures (and cattle) in 1899 and other pictures were sold in 1935 at his death ('Catalogue of Modern Pictures and Water Colour Drawings ...', Christie, Manson & Woods, London, 19 July 1935). Carolus-Duran's Un Terrassier (or Men Jardinier) is in the collection of the Sterling and Francine Clark Art Institute, Williamstown, Massachusetts, but the portrait of Robinson is now lost. (27) Moon's landscape paintings, which were rarely exhibited in his lifetime, were the subject of a memorial exhibition at the Fine Art Society, London, in 1912, Sir Frank Short, who provided a prefatory note for the catalogue, stated that Moon 'had a great love for flowers and trees, and a greater knowledge of them than most men'. The Lindley Library, London, has a number of his original botanical drawings. Judith Tankard is an art historian based in Massachusetts. Her latest book, Gardens of the Arts and Crafts Movement: Reality and Imagination, was published by Harry N. Abrams in 2004. Copyright 2019 Apollo Magazine Ltd.